1) Stick the colored stickers on the 6 sides of the dice: 3 green, 2 yellow and 1 red. 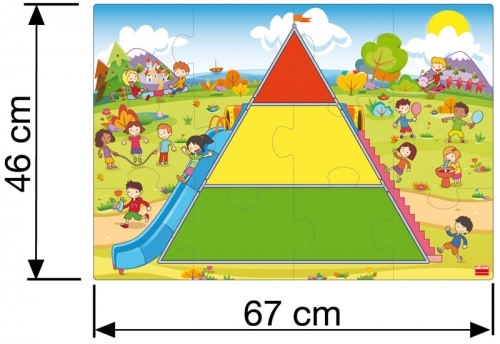 2) Do the pyramid jigsaw puzzle. 3) Put the food cards face-up and distribute them among the players. 4) The first player throws the dice and, depending on the color that appears, chooses one of his/her food cards that corresponds with that color, based on how often it should be eaten (green: often; yellow: sometimes; red: occasionally). 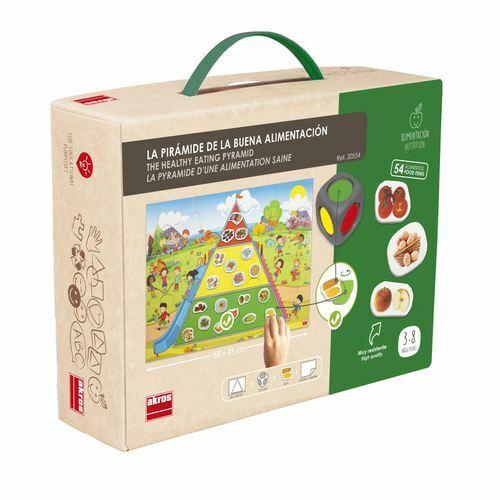 −Check the back of the food card to see whether the choice is correct (the color on the back of the card should match the color on the dice) and place on the corresponding area of the pyramid. − If it is not correct, return the food card to where it was, face-up, alongside the other food cards. 6) The turn then moves to the next player, and so on. 7) The winner is the person who gets rid of all their food cards first and correctly completes the pyramid. 3) Put all the food cards face-up in the center of the table. 4) The first player throws the dice and, depending on the color that appears, chooses a food card that corresponds with that color, based on how often it should be eaten (green: often; yellow: sometimes; red: occasionally). The other children can help him or her to choose the card. 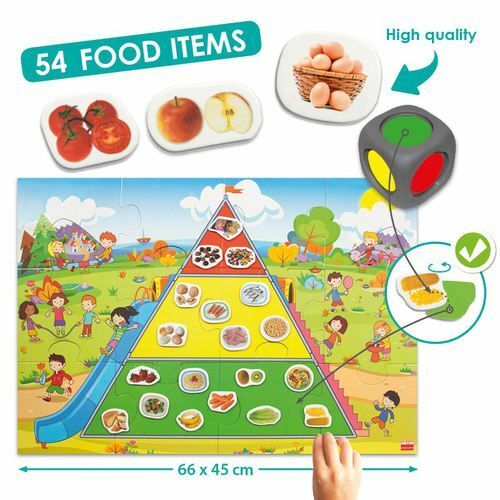 7) The game finishes when the pyramid has been completed with all the food cards. - A lot of children can play at the same time, following each other in turn.